“I love Ballo, which is as nearly perfect an opera as one is likely to find,” wrote Sir Georg Solti in his 1997 Memoirs. The conductor first performed the work as music director of the Frankfurt Opera in 1954, and six years later, Verdi’s masterful work served as Solti’s first operatic collaboration in the recording studio with soprano Birgit Nilsson, when he recorded the work with the Rome Opera in July of 1960 and 1961 (a project which began with tenor Jussi Bjoerling, but in the end enlisted the services of Carlo Bergonzi). In May and June of 1982 (with further sessions in May 1983) Solti returned to the recording studio, this time at Kingsway Hall in London, to record the work a second time, with Margaret Price and Luciano Pavarotti. The orchestra for this second recording was the National Philharmonic, a studio orchestra of players assembled from London’s principal orchestras; no stage performances were associated with this cast. 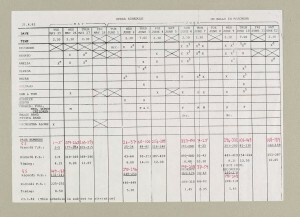 The rehearsal schedule which accompanies this conducting score indicates the day-to-day scheduling from May 25 to June 12 of 1982, in mainly afternoon (with some evening) sessions, including the pages rehearsed (Ricordi full and vocal scores) and timings. 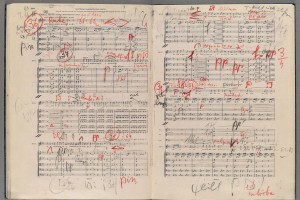 Solti performed the work complete, without cuts. Un ballo in maschera / di G. Verdi. Milano: G. Ricordi, [1896?]. Merritt Room Mus 857.1.679.7 Solti. 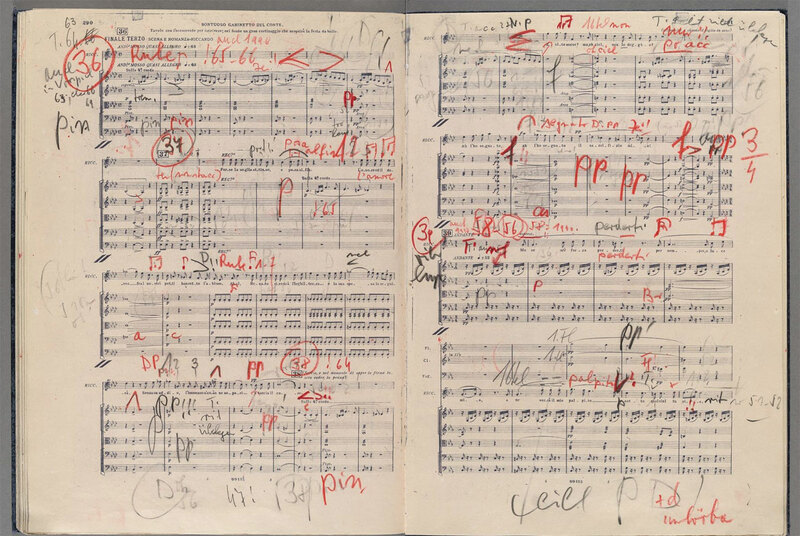 Rebound into 2 volumes with numerous annotations throughout in red and black pencil in Sir Georg Solti’s hand; rehearsal schedule (1 pg.) inserted. Gift of the Solti Estate. 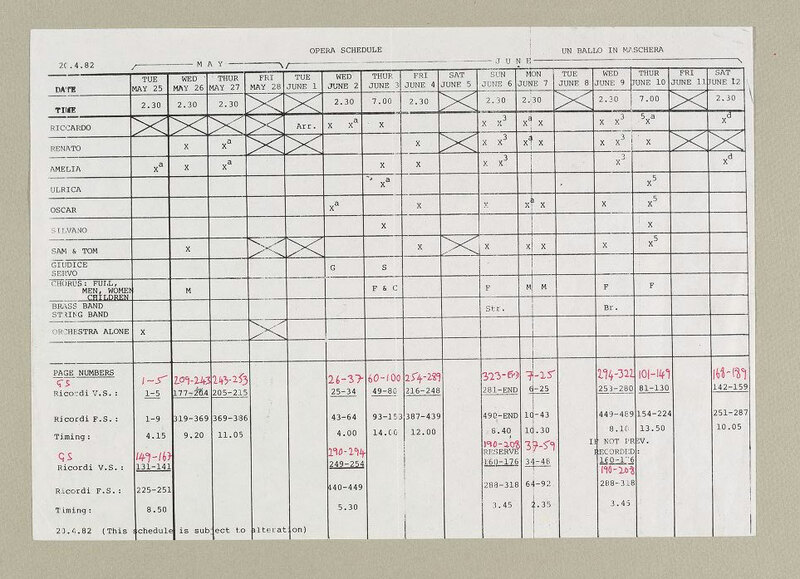 The work figured prominently in Solti’s life one further time, in July of 1989, when, following the sudden death of Herbert von Karajan, he was called upon with only a week’s notice to conduct John Schlesinger’s new production at the Salzburg Festival. His initial refusal was overcome by Plácido Domingo, and in a riveting tale involving airlifting his score from his London apartment to his summer home in Roccamare, Italy, and the intervention of the commandant of the local NATO base near Salzburg who allowed a private plane, supplied by one of the Festival’s most devoted supporters, to land there, Solti’s “potentially unrewarding and risky task” was a success; he was invited to conduct the work again at the festival the following summer. Those were to be his final performances of Un Ballo in Maschera; though any conductor who can claim as his Riccardos, Carlo Bergonzi, Luciano Pavarotti, and Plácido Domingo can be justly proud of his achievement. 1. Patmore, David N. C. “Sir Georg Solti and the Record industry,” ARSC Journal 41.2 (2010): 218, http://ezp-prod1.hul.harvard.edu/login?url=http://search.ebscohost.com/login.aspx?direct=true&db=llf&AN=503003138&site=ehost-live&scope=site (Harvard users).